The Dutch King Willem-Alexander and Queen Máxima visited Southern Germany last week. The royal visit coincided with the agri-food trade mission to Bayern that HZPC participated in. 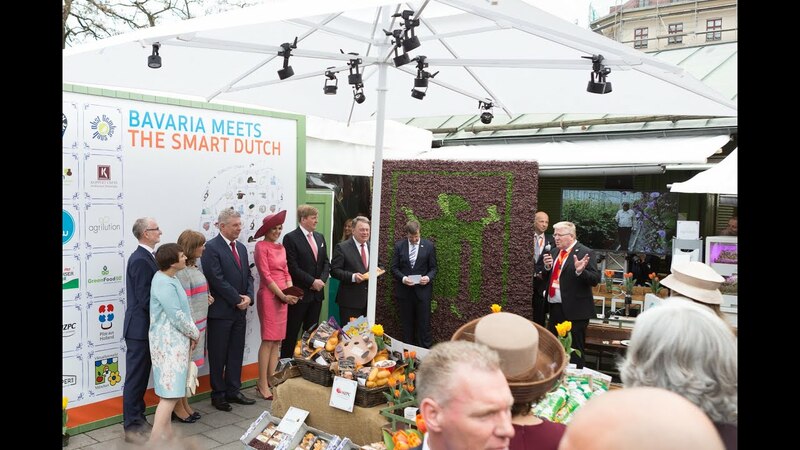 At a specially designed Dutch agri-food stand at the market in Munich, our colleague André Tekelenburg gave a pitch to the royal couple about HZPC, our innovative coloured Perupas and the success story of Annabelle in Germany. It was a great success and we gained a lot of attention! The agri-food trade mission was organized from 12-14 April by the Dutch Ministry of Foreign Affairs and lead by Dutch Minister Ploumen. The goal was to strengthen the relationships between the Netherlands and Bayern. The agrifood program was organized by the Dutch agricultural council of Berlin. More than fifteen Dutch agri-food companies and branch organisations participated in the event with the theme “Get in touch with the Dutch”.